World Travel Market, the leading global event for the travel industry, is this year celebrating its 35th event from 3 to 6 November. Over the past three and a half decades WTM has established itself as the event where the industry conducts business its deals. WTM 2013 will lead to a massive £2.2 billion in travel deals. Here we look back on the highlights and headlines of WTM since it first opened its doors way back in 1980. 1980 WTM's launch event at Olympia was opened by the Duke of Kent and Miss World, Kimberly Santos of Guam. The event was attending by 350 exhibitors and 7,753 trade visitors. 1981 Princess Alexandra opened WTM to a near riot among Sun newspaper readers when a consumer promotion went wrong. 1982 WTM had already established itself as a fixture on the travel and tourism industry's calendar with WTM 1982 attracting 50% more participants than the launch event. 1983 Paul Ryan Executive Director, Europe, Fairmont Hotels and Resorts was the first to construct a bi-level stand complete with a first floor. Up until 1983 WTM was made up entirely of shell schemes. 1984 WTM 1984 covered three Olympia Halls with each having its own entertainment stage. This increased size saw WTM 1984 attract 1,425 exhibitors and 28,922 trade visitors. 1985 The opening ceremony was standing-room only drawing its biggest crowd to date to watch Princess Diana opened the event. Princess Diana had just given birth to the youngest of her sons, Prince Harry. 1986 WTM's Global Media Network is formed. WTM now has 50 official media partners all around the world. 1987 A 'naked' Lady Godiva riding a white horse on behalf of Coventry Tourism outside Earls Court caught the attention of delegates and passers by. 1988 Possibly inspired by Lady Godiva from the year before, the Indian Tourist Office hired an elephant from a local circus to parade up and down the WTM forecourt. 1989 Princess Anne helped WTM celebrate its 10th anniversary by opening the 1989 event. The Princess, alongside exhibitors and visitors, were shocked when anti-Apartheid protestors evaded security to drop leaflets on her head. The protestors also painted Olympia's doors with red paint. 1990 WTM becomes so popular that a decision is made immediately after WTM 1990 to consider an alternative venue. The event moved to Earls Court two years later. 1991 As the Gulf War came to an end in February the effect it had on the travel industry was huge. The collapse of ILG and its UK-based subsidiaries, including Air Europe and Air Europe Express and the group's two UK airline subsidiaries created a knock on effect with many jobs and businesses closing. 1992 The move to Earl's Court saw WTM launch WTM Meridian Club (renamed WTM Buyers' Club in 2013), for the industry's senior buyers to aid negotiations with exhibitors, at the first Earls Court event. WTM Meridian Club launched with almost 7,000 (6,907) members. 1993 Croatia exhibits at WTM for the first time as an independent country following the end of fighting in the Croatian War of Independence. 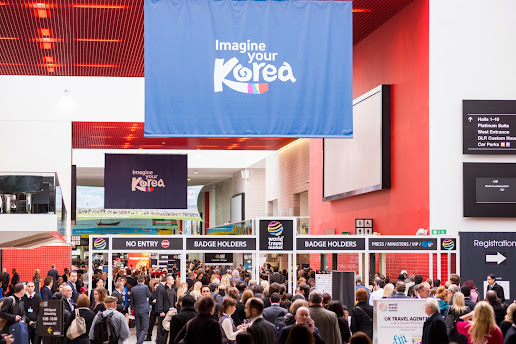 Croatia is one of more than 5,000 exhibitors taking part at the second WTM held at Earl's Court. 1994 Environment Awareness Day (now World Responsible Tourism Day) was launched to encourage greater debate on green issues. 1995 Israeli Prime Minister Yitzhak Rabin was assassinated immediately prior to WTM. Security measures were stepped up at the exhibition. 1996 US exhibitors are the focus of attention as Bill Clinton is elected for a second term as president during World Travel Market. While the event's key theme was the growing importance of technology with an Internet Café in the Central Feature Area. 1997 Meridian Day – which gave buyers exclusive access to the first day of WTM – was extended to the Monday and Tuesday, placing an even greater emphasis on concluding business deals at the event. The Egyptian Luxor massacre shocked the exhibition floor, as it took place during the event. More than 60 tourists were killed by an Islamic terrorist group. The massacre resulted in a major tightening of security measures for tourists in Egypt. 1998 Former WTM Chairman Fiona Jeffery founded international water-aid charity Just a Drop on behalf of the travel industry. The charity raises desperately needed funds to build wells, bore holes, hand pumps and run health and sanitation programmes throughout the world. The charity has raised more than £1million and supported 900,000 people in 30 countries and remains WTM's official charity. 1999 Just a Drop helps the victims of a catastrophic earthquake in Turkey with clean water and water purification packs. The earthquake killed 845 people and injured nearly 5,000. 2000 WTM celebrated its 21st birthday with Tribute 21, recognising 21 of the travel industry's top international business executives, including The Hon 'Butch' Gordon Stewart, Managing Director of Sandals Resorts; Richard Fain, Chairman and CEO Royal Caribbean Cruises; Dr Ralf Corsten, Chairman, TUI Group and Sir Richard Branson, Chairman, Virgin Group of Companies. 2001 WTM's whole programme was completely rewritten following the events of 9/11. A two minute silence was held to mark the terrorist attacks and the programme explored the impact it would have on the travel and tourism industry. 2002 WTM moves from Earl's Court to ExCeL London. Visitors were welcomed by the then Mayor of London, Ken Livingstone. The opening was performed by Her Majesty Queen Rania Al-Abdullah of Jordan. The world-famous Irish dance group Riverdance provided the entertainment, underlining ExCeL's dockside location by the River Thames. 2003 Film superstar Michael Douglas caused a stir when he made an appearance at WTM representing Mallorca, where he and his wife Catherine Zeta Jones own a holiday home. 2004 WTM celebrated its 25th Anniversary. Environmental Awareness Day - which pioneered education of green issues at World Travel Market for over 15 years - was renamed World Responsible Tourism Day. 2005 The stage musical of J.R.R Tolkien's The Lord of the Rings opened WTM. While adventurer Ultimo bra founder Michelle Mone, Ben Fogle and TV Presenter Jeff Brazier where also in attendance. 2006 The first pan-industry conference to discuss bi-lateral tourism relations with China took place during WTM. 2007 WTM hosted the first UNWTO Ministers' Summit on Tourism and Climate Change, a key part of an international programme to widen and deepen the debate on climate change when they agreed a declaration and presented to the UN's Climate Summit in Bali a month later. Also, Polar explorer Pen Hadow, opened the first WTM World Responsible Tourism Day, the world's most ambitious global day of action, designed to encourage responsible tourism activity. 2008 WTM smashes its then participant record with almost 50,000 (49,963) exhibitors, visitors, international media attending the event – an increase of 4% on 2007. 2009 World Travel Market celebrated its 30th event and launched its hugely successful Speed Networking Programme. WTM Vision Conference Series was launched with an event in London. The series now includes events in Moscow, Dubai, Shanghai, Cape Town, Sao Paulo and Rimini (Italy). 2011 Reed Travel Exhibitions announced the extension of the WTM brand in to Latin America with the 2013 launch of WTM Latin America in Sao Paulo. 2014 will see the WTM brand expanded into Africa with the launch of WTM Africa, part of RTE’s Africa Travel Week, in Cape Town. 2012 World Travel Market wins the Association of Event Organisers' Award for Best Use of Social Media. The WTM Vision Conference Series become international with the first events in China and Russia. 2013 WTM recorded its record attendance smashing through the 50,000 barrier, with increases in all participant types including an 8% increase in buyers. The event will generate a massive £2.2 billion in business deals for exhibitors.